Thengai (Coconut)buns are a nostalgic treat for me. 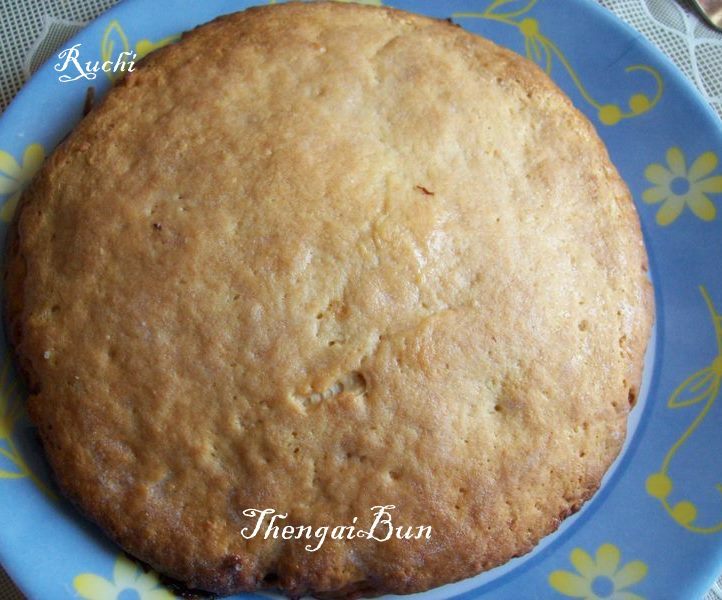 A popular stuffed bread available in the bakeries of Tenkasi in Tirunelveli Dist .When I was studying in the school I use to save money to buy the thengai Bun from the bakery shop who sold baked goods every day. All my friends who used to buy cup cakes ,pastries or puffs, but invariably I always returned to my friend, the coconut bun. I don’t know why coconut buns appeal to me so much. I think in part it’s because This Bun looks great & the coconut part looks so juicy... it makes me drool Or maybe it’s the sweet sugary crust which perfectly complements the coconut infused, raisin.tutifruti,cherry -studded flavors I love it! I don’t know. But the one which was in my regular buy list was this "Thengai Bun".. I wanted to make this for quite some time.. I tried this today evening it came out very well and Everybody liked it. 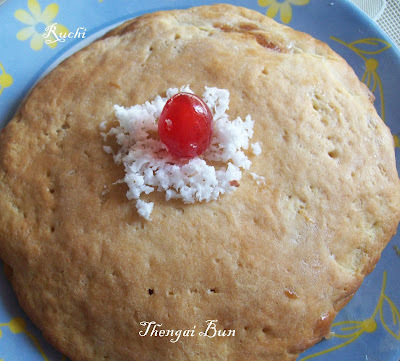 Baking this coconut bun bring back lot of childhood memories It makes me remember my school days. Hope this Bun will bring back many fond memories for all of you Too! Heat a wok at low heat, add in raw sugarwith little water until it nearly melted Cook until everything melt then add shredded coconut. Make sure the shredded coconut coated with the melted sugar. Keep stirring to prevent it burn. Mix the water with flour then add into the coconut mixture. Keep stirring until everything well combine and you could smell the fragrant of coconut mixture. It'll start become dry and you'll know it has done. Add nuts, raisins, tutti-frutti, cherry& cardamom powder. Mix well Let it cool down on a plate before use. 1) To the warm milk, add yeast and sugar and mix. Allow this to proof for about 10 minutes. It will become foamy. 2) Mix flour and salt and crumble in the cold butter. Add the yeast-milk mixture and combine until you get smooth, sticky dough. I had to add a touch more flour at this point. 3 Place dough, cover with wrap and put in a warm place (e.g. oven with light on) and let it rise for an hour or so until it doubles. 4) Punch down the dough and knead lightly. Then take a piece of about 2.5 inches diameter and flatten it lightly to a circle, place about 2 tbsp of the Coconut filling in the middle. Now, roll out the remaining ball in to same 1/4 inch thick. Prick holes. Place it on the top of the coconut & dry fruits mixtures. 5)Pull the edges over the filling and enclose it. Seal it and Fold the edges together without any gap.Place this gently on a lined and greased cookie sheet. Bake for about 15 minutes. 6)Once baked, take out and immediately apply some butter on the top. When it is warm, cut it in to pieces.Serve warm. 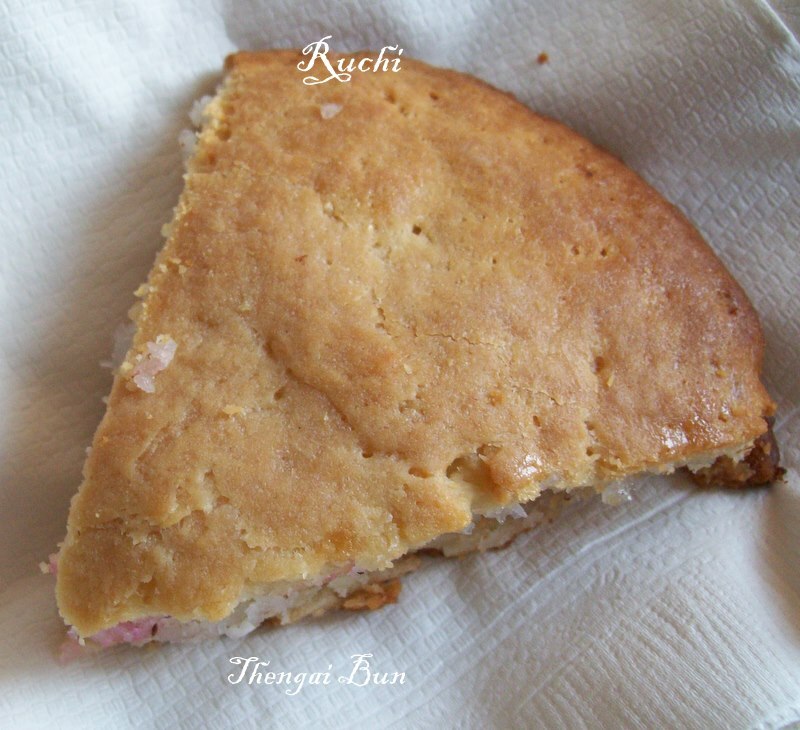 Warm coconut buns (Thengai bun) tastes great! Yummy. I remember my dad use to bring it from Bangalore on his every visit. 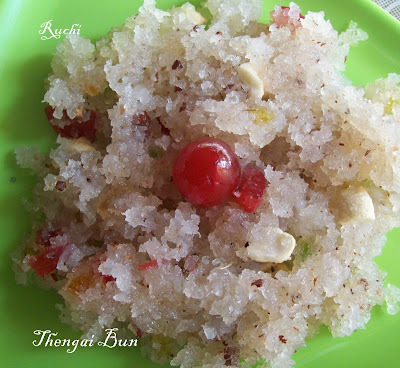 I still remember my grandma get this bun whenever she visits us..Makes me nostalgic..
swathi, LK. & Premalatha welcome to my space! I absolutely love coconut too. But somehow my mom doesn’t and so she doesn’t make coconut buns. Anyway, I guess this bun will change her opinion about coconut. I will definitely try it. Thanks for sharing the recipe. Can you please tell me on what tempreature to bake coconut bun. Thanks so much for the recipe. @ Ana, Thank u for visiting my space:) preheat oven 180degree and bake for 15 to 18 min. What is the butter quantity? 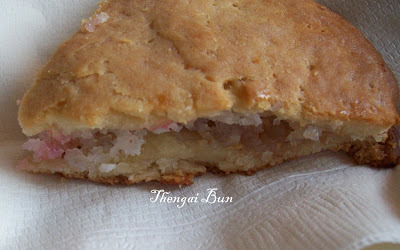 In coconut filling what flour or you mentioning?pls clarify.Bun looks neat.